I’ve ended up knowing much more than I ever expected to about piers! I’m still no expert in any particular aspect but I’ve come to know lots of facts, lots of specialisms, and have an understanding ranging from the technical to the historical to the emotional. And I believe that Colwyn Bay’s pier is next in line. Our emerging vision for the new HLF bid is here. Victoria Pier is one of just 31 surviving traditional (open-structure, iron-legged) piers. British Piers are incredibly popular. Together the survivors form an 11-mile stretch that has been visited by more than two-thirds of the British population in the last five years, and the same number say they want to go again in the next five. It may be a cliché to say so but we are an island nation, with more than 12,000 miles of coastline, the longest in Europe [World Resources Institute, data from US Defense Mapping Agency 1989]. The UK has a ratio of coast to area of 51.37, double that of Portugal and eight times that of Germany [World Factbook, data from CIA]. Seaside resorts – for health and leisure – are one of the most important cultural memes of the last two centuries and piers are both the symbols and the barometers of our historic relationship with that coast. THIS IS *THE* IMPORTANT PIER TO SAVE RIGHT NOW. An extremely deprived neighbourhood especially within the immediate vicinity of the pier Local people wanting the pier saved and being willing to step up and work together to make that happen. A town that has lost or in danger of losing its way with its heritage. A beautiful and very special pier, an unusual shape right in the centre of a lovely circular bay that has seen significant investment in the beach and prom. A ‘villain’ – not Ravenclaw in this case but rather Conwy County Borough Council wanting to spend taxpayers’ money on demolition, having won £594k of HLF funds to explore viability but given it back before doing so! We have a precedent in Hastings, where the rescue is happening right now. And I’m bringing every last scrap of knowledge from that experience, from working directly with Bognor and Southsea piers, and from the People’s Piers UK network. The town team chairman recently put forward the idea of signage ‘Colwyn Bay – Heritage Resort’, but you can’t just put a sign up and make it so! And the one thing you can’t do in a ‘heritage resort’ is wilfully demolish your greatest heritage asset. Secondly, the project itself will make a major contribution to local regeneration. Using the heritage as foundation and inspiration, the project focuses on health, learning and prosperity. These are the three themes of the ‘Vibrant & Viable Places’. regeneration framework published by the Welsh Government in 2013. The strong rhetoric of this framework could be brought alive by the Victoria Pier project. This is a rescue not just for the pier but for the people of North Wales (and everywhere that places suffer under garbage regen strategies, or brilliant rhetoric with no follow-through, or with implementation that’s obsessed with money – with who gets £12m and who gets £13.5m and who gets left out). The only way to stop this cycle of poor practice is to support projects that inspire a different approach. Projects that are led from the ground – with specialist support and peer (pier-to-pier) networking. Thirdly, this one matters because Colwyn Bay, like Hastings, will prove a fundamental point about community-led heritage regeneration: that it can over-compensate for the effort and risks involved by generating a super-abundance of benefits. The change in Hastings is profound. A town with a self-esteem problem has become confident; everyone is watching with excitement and pride; businesses are investing; properties are being spruced up; and the powerful stakeholders who were previously ignoring the seafront are now fully focused on its future. Even more importantly, everyone now knows that it’s possible, and that changes everything. Of course the skills, expertise and other resources that will be required must be identified and developed. We are honest about the need to develop the partnership, demonstrate community support, and build capacity, credibility and confidence. We are equally clear that this is how these things work – that these resources do not spring up fully-formed; they need to be nurtured and grown. That’s why we’ve written a community organiser into the heart of the project. The CO will play the more traditional role of ‘volunteer coordinator’ but in a new way that engages widely and systematically, and supports local people to take action for themselves. The Community Organiser will be out and about while, back at base on the pier, the Health & Learning Manager will help convert that interest into exciting opportunities for training, work, enterprise, volunteering, education, leisure and entertainment. Of course if we were only considering rarity and physical vulnerability, Birnbeck Pier should really be next. But when it comes to heritage regeneration, it is essential to take into account community drive, loyalty and leadership. 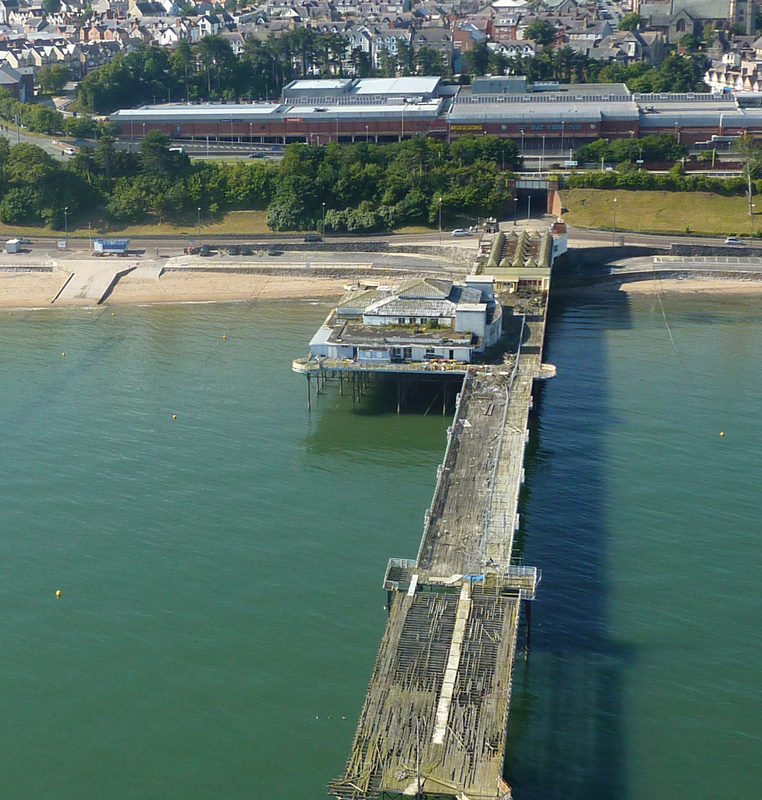 People and businesses in Colwyn Bay have proved that they care about the pier and are willing to step up to the challenge in order to protect their heritage. Colwyn Bay could be the Welsh version of Hastings and no less important for that. It is not only a Welsh asset but also one for the UK, with ready access from huge populations in the North West and West Midlands as well as further afield. Right now Victoria Pier needs your help, and fast! We are submitting a new HLF major grant application for the annual deadline on 30th November 2014. An overview of the emerging vision is here. We’re looking for partners, advisers, and investors of all kinds. If you work in heritage, health, fitness, beauty, education, enterprise, engineering, architecture, social investment, community engagement, or any other field that could be relevant to Victoria Pier, please get in touch – colwyn@jerichoroad.co.uk. And spread the word…. Thank you.